AQUAVive Shower Heads In addition to the new collection of hand showers we have developed a limited range of stunning, slim line shower heads that will satisfy the design conscious specifier and the demanding consumer who requires the rainfall experience. 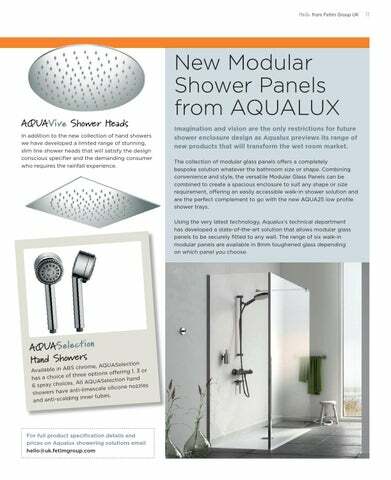 New Modular Shower Panels from AQUALUX Imagination and vision are the only restrictions for future shower enclosure design as Aqualux previews its range of new products that will transform the wet room market. The collection of modular glass panels offers a completely bespoke solution whatever the bathroom size or shape. Combining convenience and style, the versatile Modular Glass Panels can be combined to create a spacious enclosure to suit any shape or size requirement, offering an easily accessible walk-in shower solution and are the perfect complement to go with the new AQUA25 low profile shower trays. Using the very latest technology, Aqualuxâ&#x20AC;&#x2122;s technical department has developed a state-of-the-art solution that allows modular glass panels to be securely fitted to any wall. The range of six walk-in modular panels are available in 8mm toughened glass depending on which panel you choose.